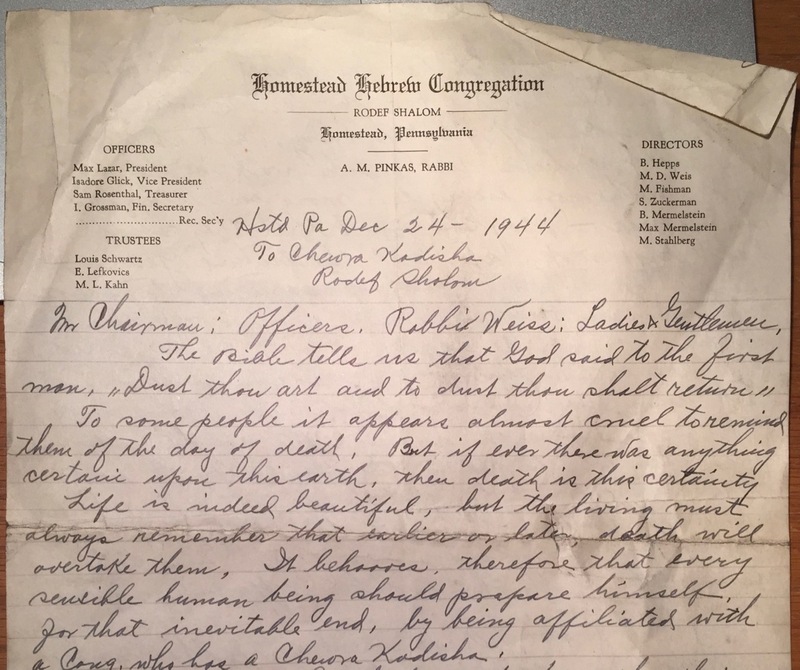 1941: This seudah was on 12/7/1941! Although Ignatz prepared a full financial report as always, once again there is no speech. 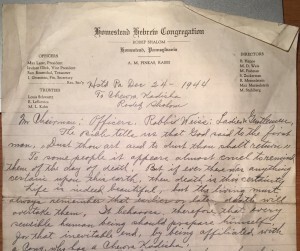 Perhaps he did not write one this year because at the time of the seudah he was feuding with the rest of the chevra kadisha over a $100 bonus they wanted to give to Harry Seiavitch, which he deemed “illegal” and a “[misappropriation]” of the congregation’s funds. For about a year he turned over his responsibilities to Zolton Smooke (though clearly he was doing the work through Smooke) before resuming his responsibilities in name. Perhaps his original speech seemed inappropriate given the earlier events of the day. 1942: Again, no speech, and I have no theory for why. I found no speeches after 1944; there aren’t even minutes from the 1947 seudah. Ignatz died September 1948, having served as secretary until his death. His son took over afterwards, serving through the end of 1951. As an introduction to the annual report, which I am herewith submitting, I wish to point out for our special observation, the work which has been accomplished. We all Know that the income we receive is derived from A. Selling lots, B. Voluntary contributions, C. Inscriptions on Memo. Tablet, D. Donations, E. some Incidentals. But the main income is from ground or lots sold, and Voluntary Donations for the upkeep. Members who pass away are entitled to free burial ground, therefore the CK does not receive any compensation from this source. Unless a member wishes to purchase a plot of ground for several graves, or a non-member purchases some ground there is no income. The expenses for upkeep, were this year somewhat more than usually, and needs to be explained. The late Mr. A.L. Hepps who has started the improvements upon the cemetery, did not spend quite as much for the upkeep as the present administration, but we must bear in mind the fact, that during the time of his activety (sic), the improvements were just completed, everything was new. Labor in those days was cheap, for example, he paid for labor at the rate of 15 c. an hour, we have to pay 40 c. an hour, almost three times as much as before, and even at that, the cost of labor was only 327.86, last year 212.46 (1932 – 210.61) or $115.40 more for the entire year, or about 33% aove the former price, while we actually paid about 167% more for the laborers. The former chairman has improved the fence and only partly the grounds. Mr Jacobson has improved every grave on the gorund. Every grave is uniformly graded, uniform plants are planted on all graves. The graves are kept in as perfect condition as possible. The grass is of a uniform grade and is uniformly clipt (sic), any washouts caused by rain is immediately filled in and attended to, So that the entire view is pleasant to the eyes of the observer. It appears to be the work of a landscape gardener cultivating a little park. Personally I have received many compliments on the aspect of the grounds not only from jews, but many gentiles expressed their admiration of approval upon the appearance of the grounds. Here I wish to state that I did not participate in the work, and I shall transfer these copmliments to him under who supervision the work was accomplished Mr Harry M Jacobson, he is the one who has helped to transform an unsightly cemetery into a little garden. May it be a Garden of Eden for those who have found repose, under the soil prepared as an everlasting resting place for our beloved departed. The total expenses for upkeep is a fraction of a cent less than $1.04 for each grave. Let us not think that the administering of a cemetery is an easy task. There are always readjustments to be made. The moderniazations were first advocated by the late Mr B Friedlander, started by the late Mr A L Hepps, and continued by our own Mr Harry M Jacobson. In submitting my annual report I shall confine myself to a financial statement. Nothing of great importance has transpired during the year, that would merit special mention. The officers who were in charge of the work to be done, have done the best possible. If they have made any errors, these errors must be attributed to faulty judgment only, for their hearts and souls were always in their work. In Summer in or Winter in hot or cold weather they always performed their duties with willing helpfulness. The results speak for themselves, and should serve as an example for those who may be the successors of the present administration. They show what a few men who are willing to extend a helping hand can accomplish. Considering all in all, peace and harmony prevailed, any arguments that arose were only questions of the best method of procedure. In principle they were always one. We lost five members of the Cong. and had six funerals for non members, and 3 Infants. It is to be noted that during the funeral services there is less excitement, less confusion, not so many managers as heretofore. There is more decorum among those who attend the funerals and with the improvement of the grounds the behavior of the people has also improved. The cost for upkeep per grave was a fraction less than 80c. We have one complaint to make. The Membership of CK consists of 62 men 60 women, 10 widows, but in case of a death, we always have trouble in getting misaskim, and can only depend on the few standbys, the rest come once a year to hear the report, and incidentally to refresh themselves with a good meal prepared for their enjoyment. I am sure they are welcome to the meal, but we would also welcome them if they would make themselves usefull (sic) instead of ornamental, when called upon. Another complaint. The people expect to get for their beloved departed the costumary (sic) El Mule Rachumim, but expect the Sec’y to be a prophet and Know the name, without being told. In addition to this I can report that we have made a contract with Hazelwood Cong. and received as part payment $500.00 on a plot of ground, the balance of $1000.00 is payable in four yearly payments of $250 each year. The ground consists of 50 adult graves. Now I will give you the financial statements of Cash receipts and disbursements . See page 106-107 in cash book. It is natural not to think, for thinking makes one [a person] sleepy. Loves his days to see all thats (sic) good. Keep away from evil, and perform good deeds, Seek peace and follow it. Mr. Chairman. Members of Chewra Kadisha, Ladies and Gentlemen. Before I give you a report permit me to say, that I am in the same position as Edy (sic) Cantor was, Sunday week ago. A preacher boasted he can make a speech on any subject without preparation. A man took a piece of white paper sealed it up in an Envelope, told him to open the Envelope next Sunday before he is to deliver his lecture, and speak on the subject he’ll find inclosed (sic). The preacher accepted the challenge. Sunday on the pulpit he opened the Envelope, and found a piece white paper (sic), Nothing written on it. He is to deliver a lecture on “Nothing.” He thought for a while, and started “In the beginning there was Nothing. God created the Heavens + Earth out of Nothing,” and on the subject of the creation he delivered a most Eloquent lecture. Last Thursday we and other thousands of American families have celebrated Thanksgiving day. Thousands of families who could afford only Roast Beef last year, celebrated with Champagne Wine and Caviar this year. General wage increases, reemployment and returning prosperity, were contributing factors to make this year’s Thanksgiving celebration the most luxurious day since 1928. Prices are generally fair and the consumption of Turkey, stuffings, Wine, Beer, fruits, Candies, Strudel, delicacies of all Kind have increased tremendously. This is one reason why we should be thankfull (sic). To night we have enjoyed a delicious Dinner prepared by our good friends the ladies. So we have another reason to be thankfull (sic) to them for the trouble they have gone to, and the efforts they have made to mke this affair as enjoyable as they possible (sic) could. The National Thanksgiving established first by Geo Washington, and last proclaimed by our Good Pres. Frankly (sic) D. Roosevelt is a coustome (sic) in this country some 150 years old. Tonight’s celebration was hundreds of years old long before Columbus was even born, or discovered America. Not only upon bread alone does men live (sic). But must strive for something higher, something nobler during our lives. They have commended us not only to remember the living, but also not to forget those who are no longer with us. And to night we are here to remember and to pay our respect to those we have lost during the year. Namely, Golda Fisher Morris Goodman and David Jacobson, and be thankfull that we are still among the living, and we pray that our lives may be prolonged on this earth. Now I am going to read a statement of Income and Expenses. We jews, every one who came from foreign lands did not immediately find a pot of gold upon our arrival, what we did find was poverty distress sorrow and death. Some forty give years ago a few men and women jewish pioneers have settled in Hstd, They said here we are a group of people from different lands settled in a new country, we have a common background, a common history, with common family and religious ties, we are a common race, lets (sic) form an organization, a jewish organization that will bind us together and will be to the benefit of all. We don’t want new fangled ideas, “What was good for my father is good enough for me.” The idea was conceived and brought to fructification. The newly formed organization took for its Motto Rodef Sholom, follow peace. They went back for their constitution to the old books, adopted customs that were established several thousand years ago, they adopted Ethics that were established not by themselves but by their ancestors who were “Prophets and Sages,” they took for their guidance the old jewish laws and traditions, Ideas which they did not invent or copyrighted (sic.) But truths that have lived thousands of years before them and are living factors to day. That they have acted wisely need not be stated here. The benefits of their efforts are exemplified here to night. If they had not started we could not follow, from this neuclus (sic) developed the Cong. Ladies Society (or Sisterhood), The Chewra Kadisha, Hebrew School, Sunday School &ct – We are progressing from year to year, may we continue to walk in the path of the righteous from generation to generation. About this years administration I can say, there is nothing flatering nore (sic) is there anything to censure. All who have had the management of the Chewra Kadisha in their hands during the year have done everything possible under prevailing conditions to make the administration successful, and have in a great measure succeeded. I wish to thank all who have cooperated in last years work, and hope they are their successors in office will do as well in the coming year. The financial Report will be found in Cash Book page 130-131. 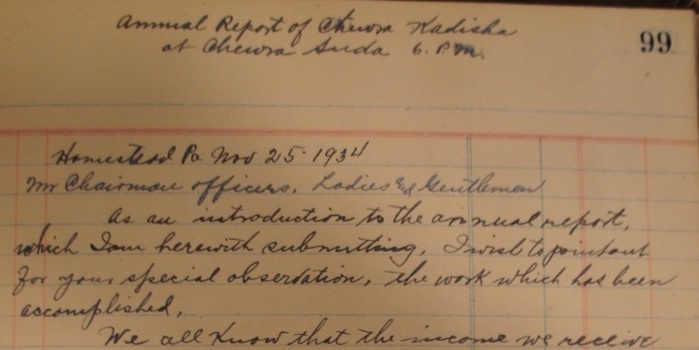 Jan. 1912 or today 26 years ago the Chewra Kadisha was organized. The first Sec’y Treas. was Mr Hyman Podolsky. We had since then Mssrs (sic) Jos Weinberger IJ Goldston, Sam Rosenthal as Sec’y. They served faithfully for some years according to their ability. In Jan 1924 or 14 years ago, the writer of this had the honor confered (sic) upon him to serve as your Sec’y. What has been accomplished I have from time to time reported. To day we are glad to report that we did not have many losses during the year, We lost 2 members during the year, and we had two none members buried at our cemetery. We had good luck, or perhaps good forsight to elect officers who were imbued with the spirit of loyalty towards the work assigned to them, Mr Ben Friedlander, A.L. Hepps of blessed memory, at first – and Mr H M Jacobson and last but not least our own Ben Mermelstein. And we can see to day that thru their efforts we have a place to enter our friends and relatives, w ho depart from this world superior to most cemeteries and inferior to none. May God bless them with long life for their work, — and may the Souls of those who have departed Rest in Peace. Only God can repay them for their good work. We Know that man has emerged out of the nineteenth into the twentieth century, and there was been great changes of every kind, customs have changed Philosophies have changes, science has changed, Amusements have changed. In the supreme essential, God above all, there has been no change. God is the Lord of the centuries, with him there is no change., he gives life and gives death. Many waters cannot quench love, Love is nothing less than the power that created and upholds th eworld. Therefore in a world full of cruelty and barbarism it behooves us as jews to practice this virtue of love towards one another, and exemplify the preaching of love with a little practice in our midsth (sic), it cant hurt any one of us. Now permit me to read the financial statement. Ladies + Gentlemen. Mr Chairman + Members. We are again assembled here to night to give our acc’t of what happened in our community in the past year, before I read my report permit me to say a few words, as an introduction to my report, a few observations which I wish to impart to you. The world of today is a sad place to live in. In the natural course of events it is a sad place. Every one who comes into this world is born in pain. The child when it arrives come crying with pain, and its destination is tragic, sooner or later it leaves this world with a struggle of life with death, eventually Death is the conquered. During life we have to struggle to make a living for ourselves, we endure hardship, we encounter disappointments and suffering, we live in hope and expectations which are never realized. This is in normal times. I will not go into relating the present crazy Hitler + Stalin eras. You are all familiar with them. Occasionaly (sic) a ray of sunshine penetrates our life for instance tonight. This Chewra Suda, which the good ladies have prepared for us, for their kindness in preparing this Dinner we are thankfull to them. But in the midsth (sic) of our pleasure, if we look around we find injustice prevailing even in our small group, more or less “Sinas Chinom”reigns among us which should be eliminated and could be eliminated if we only had the wish to do it. The pleasure we enjoy tonight is also mixed with sadness. We have to remind ourselves that we have lost during this year 12 jewish souls of our community, Thus can we say א יודישע שימחה קען קיינמאל ניט ער פולט ווערדען 12 I am going to read the names of those who have departed during this year, and left our community, and let us hope they have found a better more peacefull world than this our world…. To day we celebrate the yearly Chewra Kadisha Suda. This is a custom from time immemorial. At the same time it behooves us to mourn the deaths of those who have left us, never to return. While we celebrate, we also mourn. Some of those who we mourn have served us and our community four almost a half century. Their influence was felt in jewish, Congregational, charitable, and Social work. They tried to be of service to their people, exemplified by true devotion, to any cause which they thought was just. Their advice was frequently sought by the Cong. on jewish problems, and their wisdom was respected. Our beloved friends have been taken from us by their maker. But their spirit is still with us, it should ever live in our hearts and minds. The following past (sic) away this year. – Members of the Congregation … None Members…. Part of the 1944 speech (click to enlarge). Life is indeed beautiful, but the living must always remember that earlier or later, death will overtake them. If behooves, therefore that they sensible human being should prepare himself, for that inevitable end, by being affiliated with a Cong. who has a Chewra Kadisha. Once a year the Ch Kadisha prepares a Chewra Suda, not for the purpose to eat and drink and have a good time, but rather to give an accounting of what has transpired, and what has been don (sic) in the past twelve months. It is a kind of stock taking, and at the same time all members resolve to work in the holy work with more energie (sic), more earnestly, the coming year, — (May God grant that they shall have no work at all the entire year)– שלא על מנת לקבל פרס 15 without expecting to receive any financial reward for the hard work they must do, but to do חסד של אמת [true lovingkindness] with the departed.